Presented here is an absolutely outstanding and historically significant 1920 Babe Ruth Underwood & Underwood batting photo that was originally taken at the Yankees 1920 Hot Springs Arkansas spring training facility. Indeed, this photo certainly suffices as one of the earliest "Sultan of Swat" New York Yankee images after his world-renowned exodus from Boston before the 1920 season. 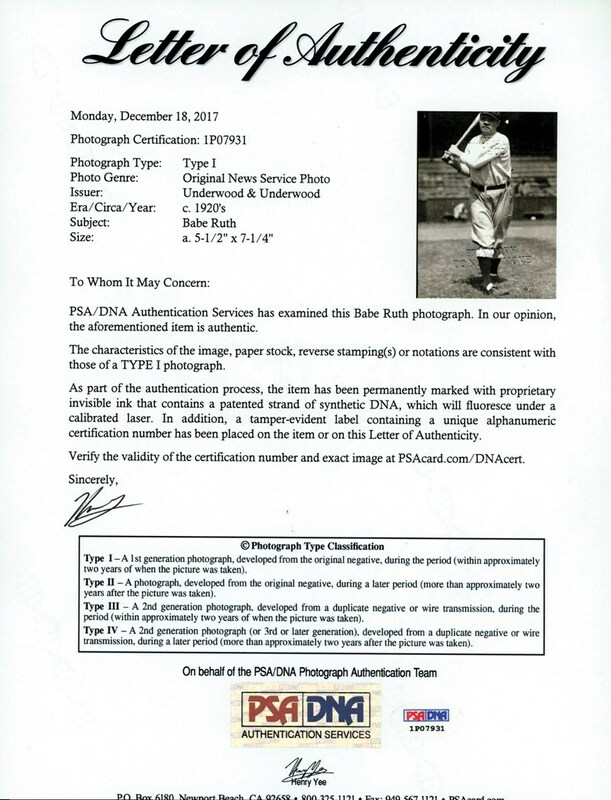 Even more impressive is that this museum worthy image is listed on page 161 in Henry Yee/Marshal Fogel's classic "A PORTRAIT OF BASEBALL PHOTOGRPAHY, Volume 2" publication that details baseball's greatest photos, photographers and news services, as well as providing a vivid account of the Type 1-4 classifications. Directly under this exalted illustration on page 161, it clearly states: "Underwood & Underwood, 1920 – The birth of Boston's Curse! One of the Babe's first photos as a member of the New York Yankees was taken during Yankee Spring Training at Hot Springs, Arkansas in March of 1920". This photo would have never been struck had the Yankees not revealed a significant interest in the young and flamboyant slugger that can be traced back to the 1919 season. That season, the Red Sox realized Ruth's unparalleled batting skills necessitated his appearance on a baseball field nearly every game and not just as a starting pitcher. The "Bambino" responded by walloping 29 home runs in 130 games (while appearing in only 17 games as a pitcher). It was now obvious that this brash young superstar hurler had so much more to offer than his left arm, with his 29 round-trippers easily setting a then single-season record. 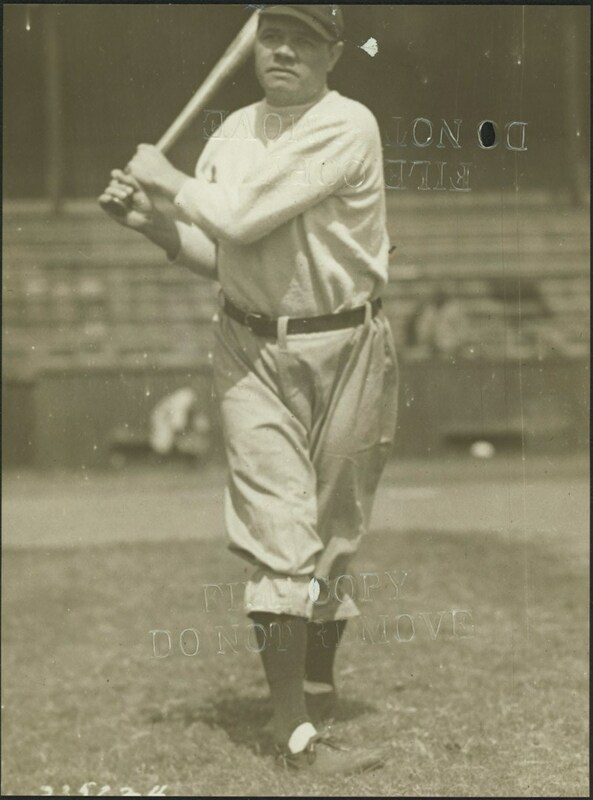 Unfortunately for Boston, Ruth would not continue his batting exploits with the Red Sox since he was sold to the Yankees by Harry Frazee to fund his "No, No, Nanette" theatre production before the start of the 1920 season. Babe Ruth's new home was now the New York Polo Grounds (Yankee Stadium wasn't open until 1923), and he didn't disappoint his new fan base, slugging an unheard of 54 and 59 home runs in his first two seasons with the Yankees! Not only did Ruth double his previous record of 29 dingers, he was out-homering virtually every major-league ball club! 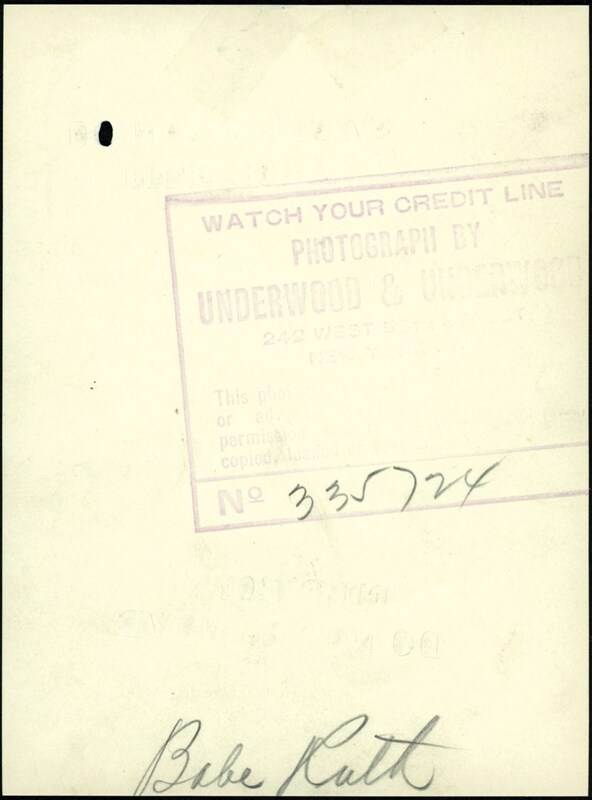 Artifacts from Ruth's inaugural Yankee season are few and far between, justifying why this Cooperstown worthy 1920 Underwood & Underwood Original Type I photo is an extraordinary link to Ruth's Yankee origin. Measuring approximately 5-1/2" x 7-1/4", this iconic image is accompanied by a full PSA Type I LOA. Ruth's crystal clear black & white batting image is absolutely stunning, as the Bambino completes his mighty swing donning his classic Yankee pants and sweatshirt. While the edges do reveal a modest trim that has removed a portion of Ruth's Yankee cap, a majority of the critical central batting image is intact.